You'll have no doubt read my two previous blogs (here and here) on the very disappointing approach to cycling that Glasgow council has. In a nutshell, they will not commit to future spending on cycling. I will soon post a more detailed blog on the meeting we had, as there is more to tell. However, in the mean time, GCC and Frank have released details of a new cycling initiative in the city. You can read about this 'initiative' here. Oh dear. It's a wee online thingy where you get to play the part of a road user (you can chose to be a bus driver...cool....), you get to watch some videos and you have to answer some multiple choice questions about what a good driver/cyclist, like yourself of course, would do. Yes, you've guessed it, I'm not entirely enamoured with this idea. In fact, I'd go as far to describe it by its correct technical term....an utterly useless piece of fluff. Yes, this is a total and utter waste of time. However, I'm a scientist by trade, so I thought I'd do a wee experiment. I thought I'd give it a go. You can try it for yourself here. Well, actually.....it's not. The reality is it is mind numbingly boring, and after two or three scenarios you really do start to get irritated with the narrators slightly condescending tone. However, I persevered and managed to play the part of a cyclist, a HGV driver and a bus driver. I gave up after that. I just couldn't take any more. So what did I learn? Well, umm, err, nothing really. OK I suppose that being a cycle safety campaigner, I should be expected to know all this stuff (I'm not perfect of course!). However, I'd be really surprised if anyone would learn anything. Yes you do get told that beeping your horn at cyclists to tell them to get out your way is wrong, but if we are all honest, we all know that, including the people who do it. They generally know it is wrong, but that doesn't stop them. They do it anyway because it makes them feel a bit better. That showed that dam cyclist!!! Ooh, maybe I shouldn't have done it.....tee hee. Very few people will do it (unless forced). Even fewer people will make it to the end (again unless forced, probably with threat of a right good scalding). For anyone who makes it to the end (most likely cycle campaigners who are unfortunately used to getting a scalding) will quickly forget the experience the next time they are late for their 1pm hair appointment. Some of the advice is downright dangerous! Hold the bus! Some of the advice is downright dangerous?!?! Yes. One particular situation aimed at HGV drivers and bus drivers is totally wrong. Have a look at scenario 4 in both the bus and HGV section. You're on a tight twisty country road, a cyclist is a ahead. What do you do? Slow down and wait for a sufficient gap to allow at least one arms length between you and the cyclist and then overtake. One arms length! One bloody arms length? Oh no, it's this again! So not only is this thing not going to be watched by anyone that matters, in the slight off chance that a bus or HGV driver does watch it, he will feel justified in passing me less than the 3ft absolute minimum that just about everyone else in the entire universe accepts is....the absolute minimum!! So the bottom line is that Glasgow will not commit to doing anything that WILL actually make cyclists lives safer, by investing in properly designed, properly connect and properly funded cycle infrastructure as confirmed at my meeting earlier this week, but they will invest money into fluff, that is not only fluff, but that contains some dangerous information? Well done Glasgow. Well done. Glasgow City Council has won its second award in four months for its achievements in cycling and sustainable transport. Yup! 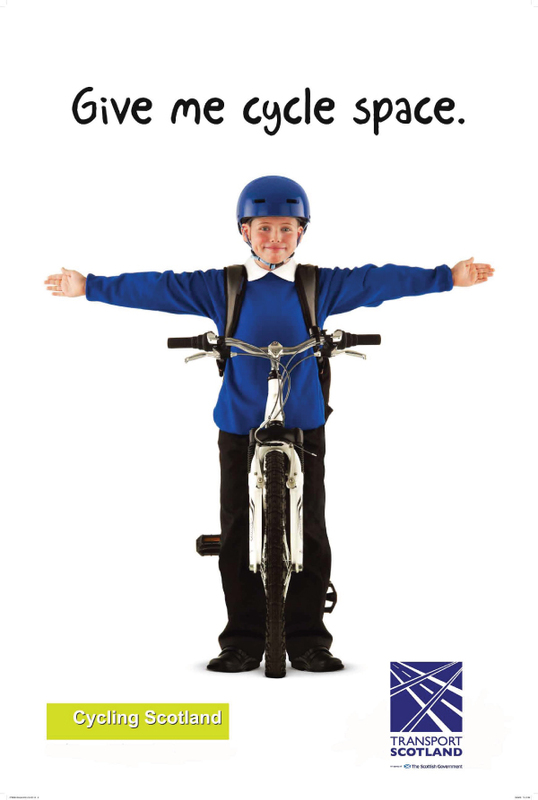 Glasgow has been awarded for excellence in developing cycle infrastructure! Ok, so they won the award for a scheme in which they didn't actually invest any money, but don't let that spoil the party. It's official. Glasgow is Miles Better when it comes to cycling. I have a bus pass me at "arms length" the other day - not something which should be the norm! Tourmalet! Not the Mountain the Cucu Jersey!